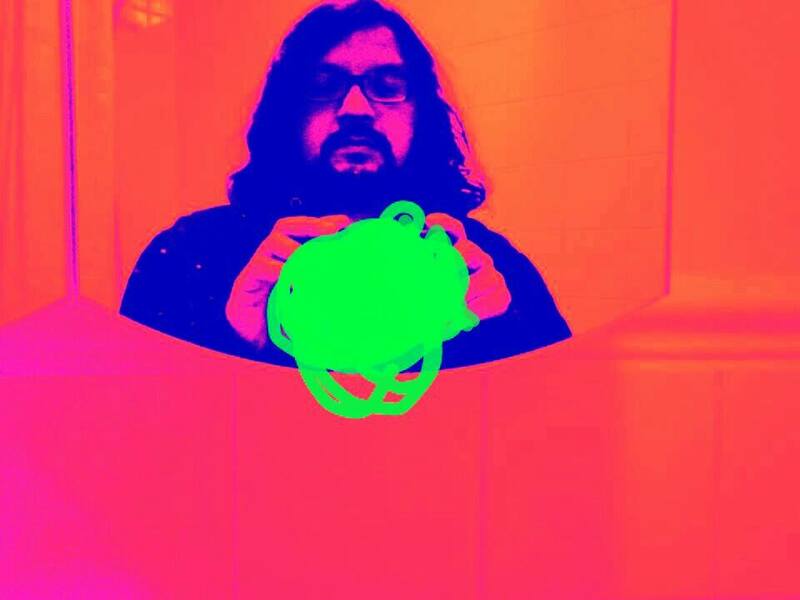 Texas Bob Juarez is a singer-songwriter, multi-instrumentalist and solo artist based in Liverpool, whose commitment to his craft, dexterity and firebrand live performances have established him as an exciting and charismatic act. Having worked with Adam Ant, MGMT and supported The Jesus and Mary Chain etc, Juarez also currently accompanies Rose McDowall (Strawberry Switchblade) on guitar and part of the most recent line up of Television Personalities , which are currently on a hiatus. A diverse, passionate and emotionally driven artist, Juarez goes beyond the call of duty and whose album “Sparkle Stars… Northern Lights I See”, has been selected as my “Album of the Month”. “Sparkle Stars… Northern Lights I See” is a Post-punk, neo-psychedelic, dark wave, neo-folk, introspective journey, a celestial catharsis, whose raw emotions are embodied within every iota of its sounds. With guest co-writing and production from James Richardson (MGMT,Kuroma) on the track ” PForest”, “Sparkle Stars… Northern Lights I See” is a wondrous album, etched in sorrow, melancholy and nostalgia. It’s an album peering through the lens of a kaleidoscopic telescope, observing how prisms of light mutated into a new spectrum of colours. Through the oblique riffs and reflective lyrics, “Sparkle Stars… Northern Lights I See” slants off its axis, fluctuating between darkness and light, orbiting close to its distant stars, whilst spinning through an array of cepheid variables. It’s a mass of nebulas, ignited from the the stars within, illuminating from the cosmic dust, whilst reflecting from its silhouettes. It’s a spectacular album, whose sentiments are naked to the human eye, whilst obscured by the dark matter. 1) With the opening track, “Hamburg Skies”, Jurarez creates a wistful euphoria that trembles in woe and sorrow, pulsated by the rumbling beats. It’s a deceptively catchy song, a propulsive clatter of melodic hooks, jangly riffs, drones and guitar dexterity that wears its heart on its surviving sleeve. 2) Through the echo-laden acoustics, muffled voices and haunting falsetta, “End of Days” orbits within the dark matter, with the glow of the Big Bang, still radiating across its blackened skies. It’s an intriguing track, whose Barrett-esqe wailing evokes a strong sense of melancholy, whilst colliding with a cluster of neutron stars and descending towards a black hole. 3) Through the goth-synths, “Ghost Song (reprise)” waltzes and spins like a ride in a Victorian fun fair. Through the orchestral sweeps and back-tracking synths, “Ghost Song (reprise)” creates a Celestial graveyard, casting shadows whilst rebounding from a supernova explosion. Along with the vocal-free presence, “Ghost Song (reprise)” could be a b-side from This Mortal Coil, orbiting close to 80s dark wave, evoking its own sense of haunting beauty, whilst fading into obscurity. 4) “Moscow” is a sublime folk song, whose Spanish-esque acoustics are inflamed with passion and discord amongst the swaying harmonies.With stripped away vocals, “Moscow” lays bare its emotions, slamming and surrendering its gypsy spirit. 5) Through the menacing drones and spectral chants, “Our Last Dance” sounds like space monks on a voyage into a far away galaxy. It’s a chilling track whose high frequency synths act like radio transmitters, sending out signals to the wailing space beasts. Along with abstract synths, “Our Last Dance” evokes images of meteorite showers cascading from the gods, washing away the remnants and cosmic dust of yesteryear. 6) Through the thuds and stripped down acoustics, “Light at The End” encapsulates the wistful motif of the track. Through the melancholic vocals and lyrics, “Light at The End” sails the night skies in discord and whose tumultuous tides ebb and flow under the waning moon. 7) Through the clatter of drones and glimmering acoustics, “Norge 3 am” jangles and rotates in a galactic disk. It’s a haunting track whose razor riffs cut through the visceral veins, drawing blood. Through the wailing drones, “Norge 3 am” releases its deepest emotions and is air-lifted by the space-copter in a torrent of lights and flashes, propelling towards unknown territory. 8) Through the thunderous synths, “Ocean Roars” releases its tsunami tides, sending shock waves to its inner core. It’s a dramatic track, whose shuddering synths prowl like outtakes from the “War of The Worlds” soundtrack, creating a prog-rock, space-rock ambience. Through the pounding piano, “Ocean Roars” funeral-marches towards its desolate land, whilst the tranquillised waves return to their shores. 9) Through the overlapping orchestral synths, “Reynisfiara (real life awaits us)”, sweeps the album towards a synth-pop horizon. It’s a fleeting track, tinged with dark romanticism, whilst lifted by the ethereal ambience. 10) Not an artist to stick to one beaten track, “Rainbow Girl” catapults Juarez into his punk roots with a formidable force. A grunge-punk catharsis, “Rainbow Girl” is a firebrand song whose lovelorn lyrics are delivered with sheer grit and adrenaline fuelled angst. Through its up-tempo beats, “Rainbow Girl” kick-starts with Joy Division-esque industrial claps, whilst moving to the edge of darkness with its raw vocals and murky, dirty riffs. 11) Through the rummaging Piano, “Holdin On” wallows in discord and melancholy. Another vocal- free track, “Holdin On” reminds us yet again of the accomplished musicianship and diversity of Juarez, as an artist and as a muti-instrumentalist, through his ability to convey emotions from a whole range of sub-genres. 12) “Screaming to get out” is an exquisite track, whose falsetta vocals soar like a hybrid of Thom Yorke and Jeff Buckley, unleashing its deepest emotions. A track etched in sorrow, “Screaming to get out” tinkles under the the sunlit clouds, inflamed by the crepuscular rays. It’s a track whose raw emotion is captured in one take, and whose Spanish-esque riffs rotate and gallop in full panoramic view. 13) Through the illuminated riffs and sluggish beats and slams, “PForest” again showcases Juarez’s skill at producing an emotionally charged track, without the use of vocals. It’s a great track, which resides amongst the Syd Barrett’s soul, the fire-flies and the sleepy creatures, under the twinkling stars, preparing for hibernation. 14) Through the aloof vocals and torpid piano, “By the Bridge She Waits” is saturated in sorrow and whose translucent tones, trail like an apparition floating mid-air. It’s a hauntingly beautiful track, laid bare, whilst remaining a billion light years away. 15) “Survive” is a sublime track, whose unhinged vocals levitate and soar above the acoustic riffs. Like a lucid dream, “Survive” drifts you off to celestial heights, amongst the moonbeams, stars and cosmic dust. Along with the tinkering piano and descending vocals, “Survive” collapses like a neutron star, in a cloud of interstellar matter, waiting to be reborn again. 16) “By the Bridge (reprise)” revisits the shadows of the moon in its darkest hour. It is raw emotions personified, and whose sentiments are crystallised in the heart-rending vocals and piano strikes. Depicting sorrow in the most primal sense, “By the Bridge (reprise)” filters pain with the utmost creativity, spontaneity and authenticity and is testament to Juarez as a true artist. 17) “The Ghost Song” is a pensive track, whose acoustic riffs strum, tinkle, slam and slant aside the resonating vocals. With lyrics such as “Is it real or just my mind”, and “footsteps, shadow of you, standing there, looking at me and the wall it goes” encapsulates the sentiments of the track and illustrates Juarez’s talent for imaginitive songwriting. Along with the synth-pop outtro, “The Ghost Song (reprise)” is a great reminder of Juarez’s skill at sending an invite to the realms of his metaphysical soul, allowing the music to provide an abstract, surreal and eerie soundscape. Sparkle Stars…Northern Lights I See by Texas Bob Juarez can be purchased via the following link.